We read Scripture together, using lectio divina to explore the movement between text and context. We heard two short stories of how listening in mission changed us. We were introduced to two components of the Listening in Mission Practical Learning course. First, five online sessions that will be a support and an encouragement. It is lonely leading in mission and we need ways to encourage and be encouraged. Second, a listening in mission project. Each participant is invited to conduct a listening in action in their community, gathering a team of 4-6 people to engage in four guided listening exercises. 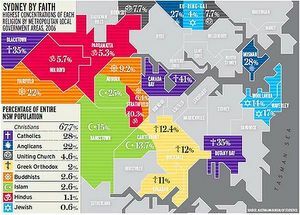 This is embodied listening, quite different from surveys or census data. Today felt small and yet big. Small, in that the sixty minutes flashed by. Small in that other education providers have been doing this for years. Big, in that the technology worked, the audio was good, the group made immediate and excellent use of chat. Big in that KCML is resourcing ministers without requiring them to travel. Big in that this could apply in other areas of KCML life – a further course on experimenting in mission, or growing in preaching or enhancing resilience in leadership etc etc. 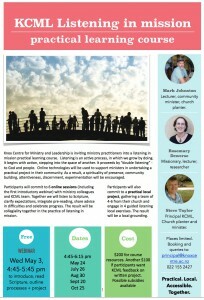 mobile, accessible and collaborative theological reflection and formation. Today we did that. We created a learning community, by being mobile in technology, accessible in taking a process we use with our interns and making it available more widely, collaborative as three KCML Faculty worked together to share the leadership. It was an exciting day for KCML today. 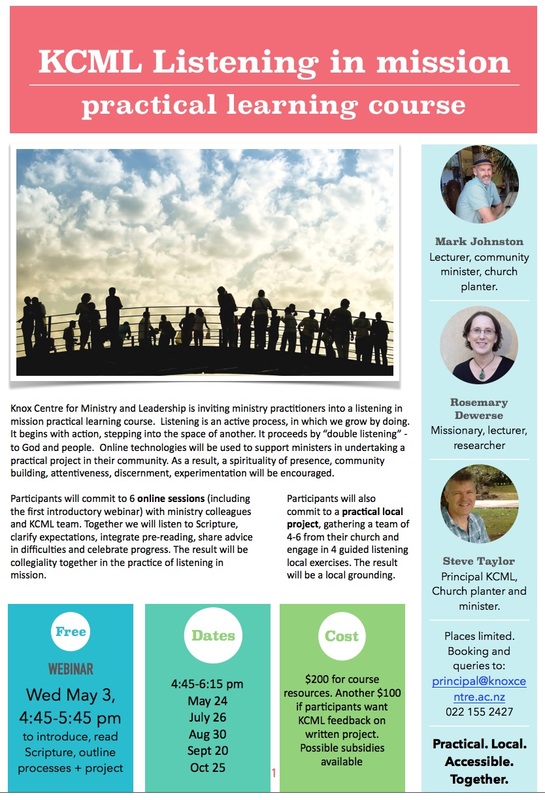 Knox Centre for Ministry and Leadership is inviting ministry practitioners into a listening in mission practical learning course. Listening is an active process, in which we grow by doing. It begins with action, stepping into the space of another. It proceeds by “double listening” – to God and people. Online technologies will be used to support ministers in undertaking a practical project in their community. Participants will commit to 6 online sessions (including the first introductory webinar) with ministry colleagues and the KCML team of Mark Johnston, Rosemary Dewerse and Steve Taylor. 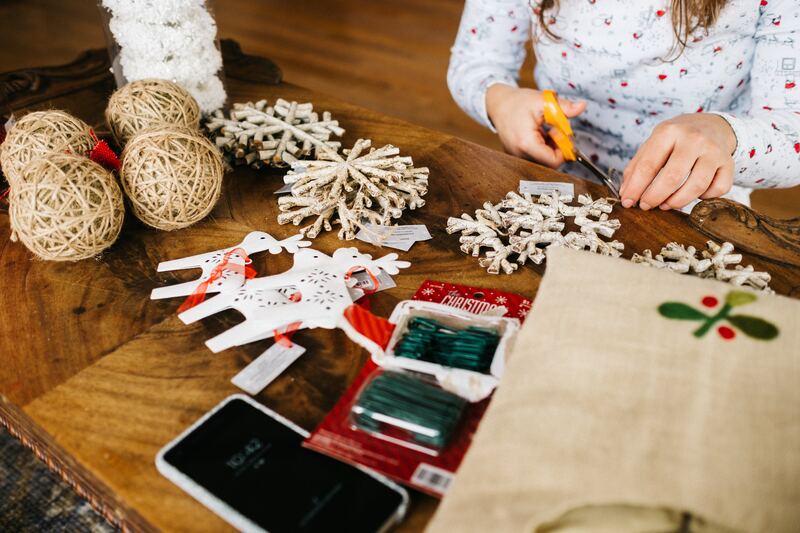 Participants will also commit to a practical local project, gathering a team of 4-6 from their church to engage in 4 guided listening local exercises. As a result, a spirituality of presence, community building, attentiveness, discernment, experimentation will be encouraged. Free information webinar Wednesday, May 3, 4:45-5:45 pm. Introduction: Faith lives in a complex relationship with surrounding culture. 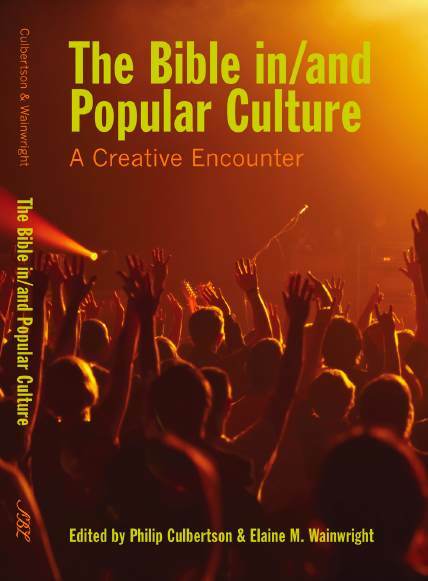 Christians inhabit a set of beliefs regarding who God is and how God acts in our world today. These become particularly pointed when tragedy strikes. How does the church respond to unexpected violence? 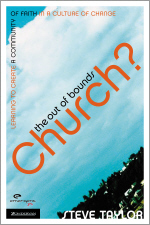 What resources does the church draw upon? How to speak of the nature of God, humans and Christian responses to tragedy? One place to seek answers to these questions is in pastoral prayer. Christian practices articulate a practical theology. As such, the gathered worship service is theory laden, offering insight into Christian understandings of how God is engaged in human history. What Christians pray – what they do and do not say – is thus a potentially fruitful avenue for conducting research into ecclesiastical and religious practice. 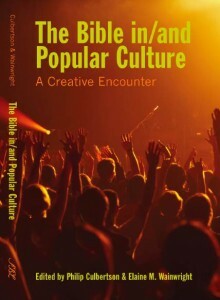 Such an approach is suggested in Coakley and Wells, Praying for England: Priestly Presence in Contemporary Culture , who explore not only the complexity of liturgical leadership, but also how those who pray and preach in fact become active agents that draw forth the desires and prayers from among those they serve. This research project seeks to understand how local churches prayed on Sunday 15 November. The date is significant because on Friday, 13 November, a series of coordinated terrorist attacks occurred in Paris. At the same time, a number of other tragedies occurred, including bombings in Beirut and Baghdad. As churches gathered on Sunday 15 November, how did they pray? What factors were at work in the choice to pray, or not? What resources might have been drawn upon? What theologies were at work in the response? Method: The aim was to conduct an empirically descriptive study, in order to reflect theologically on ecclesiastical practice, in this case the church service. An online survey, was designed, consisting of ten questions. It was piloted with a number of colleagues at Knox Centre for Ministry and Leadership. An email was then sent to pastoral leaders in two New Zealand denominations, the Presbyterian Church of Aotearoa New Zealand and the Baptist Churches of Aotearoa New Zealand, inviting them to participate in the online survey. A notice was also posted on twitter and Facebook, asking people to share. This presented three different and distinct avenues for gaining data. The study had a number of limits. The response was likely to be skewed toward those who did respond prayerfully. Further, the reach was determined by the social media reach of the two researchers. However, the research does not claim to capture a quantitatively representative sample. Rather it will only claim to provide a qualitative data set, to explore the theologies at work in lived practice. Results: The survey was closed on December 1, 2015. In just over two weeks, 155 responses had been received. These will be analysed in order to provide an empirically descriptive and critically constructive theory of ecclesiastical and religious practice in society. As time allows, the results will be processed and avenues for publication sought. One way to “revalue” the worth of the lives we teach is to examine the pedagogies we employ. Educational research reminds us that all pedagogies speak, offering a “hidden curriculum.” What are the truths expressed in the “babble of information” that originates from our teaching? Is e-learning a pandering toward “endless opportunities for self-gratification”? 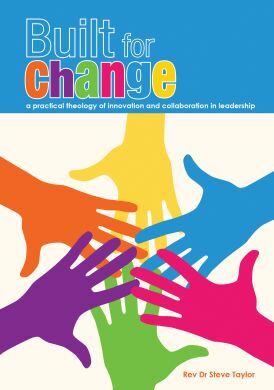 This paper will explore pedagogical innovation in teaching. Participation in a Flinders University Community of Practice in 2014 provided an opportunity to research student experience when teaching is approached as mobile, accessible and connective. A core topic (Theology of Jesus Christ) was taught using e-learning technologies, including video conferencing and Moodle. Blooms taxonomy was used as a theoretical frame to negotiate the change with students and the shift in contact time from lecturer-driven content to student-centred small group activities. Changes were made to assessment, shifting participation from face to face to digital, in order to enable connectivity. Indigenous voices were introduced to enhance access. Students completed a written survey at three points during the course. The results demonstrate that a significant shift had occcured in the class, with students moving from an appreciation of content, to a consideration of how they learn from the diversity inherent among their peers. Students felt the changes enhanced their ability to communicate effectively, appreciate collaborative learning and connect across boundaries. This suggests that the pedagogies we deploy do indeed have the potential to “revalue” the worth of the lives of those we teach. “There is even less discussion with supervisors about the changes that might be produced by what I see as rapidly expanding DIY doctoral education practices” – books, blogs, webinars, forums, chats – “Much of this socially mediated DIY activity is international, cross-disciplinary and all day/all night … something is happening here and we (collectively) don’t know what it is. … It’s a field which is fragmented, partially marketised, unregulated and a bit feral. But it’s big, it’s powerful, more and more doctoral researchers are into it, and it is profoundly pedagogical. I’m concerned that British universities are generally (and of course there are exceptions, but mostly this is the case) not helping supervisors to think about this DIY supervision trend and what it means for how doctoral education is changing – and crucially, what the implications for their supervision practices might be.” (Some excerpts from a recent blog post on the rise of DIY in post-graduate study. The links to spirituality, leadership and church are obvious. For many folk, the internet has become a huge resource in sustaining faith. This is only a hunch, but I doubt emerging church and fresh expressions would have had nearly the impact (for good and bad) without the internet. It is a place awash with resources for leaders – sermons to hear, places to discuss, people to follow. I’ve spent the last two days at the Education for Ministry working group. It is a Uniting Church Assembly project. I’ve sat with 9 leaders from across the Uniting Church in Australia, talking about the future of formation for ministry. Our focus was formal training, and all the time, what about the “big,” “powerful,” and “pedagogical” training that is the DIY of living in a world socially mediated? What are those we train learning via the internet? Who are they “following” that is partial, fragmented and unregulated? What does this mean for how leaders are being formed today? Each month I publish a film review, for Touchstone (the New Zealand Methodist magazine). Stretching back to 2005, some 85 plus films later, here is the review for November, of New Zealand film, White Lies. “White Lies” has the same producer (John Barnett) and original writer (Witi Ihimaera) as the now celebrated New Zealand film “Whale Rider.” Yet “White Lies” offers a far darker exploration of New Zealand’s bi-cultural identity. The era is early twentieth century and Maori medicine woman, Paraiti (Whirikamako Black) gathers native herbs and provides medical care for her people, scattered throughout Te Urewera wilderness. On a rare trip to the city, she is furtively asked by Maori housekeeper, Maraea (Rebecca House), to help her wealthy mistress, Rebecca Vickers (Antonia Prebble), keep a secret. Together, these three women generate the emotional heart of the movie, an interwoven pairing of life with death and death with life. Initially, Paraiti refuses to help, chilled by the alien whiteness of the world in which Maraea and Rebecca live. Her mind is changed by subsequent events, a child birth gone wrong, during which Pakeha display a callous disdain for Maori patterns and practices. All of which is history, for in 1907 the New Zealand Government passed the Tohunga Suppression Act, which limited the services Maori could provide to their communities. For Paraiti, her actions will be an act of resistance, a way of restoring some justice. Plaudits are also due to other New Zealand artists. The house in which Rebecca lives is a triumph for film designer, Tracey Collins, while the forests in which Paraiti gathers herbs and the room in which Rebecca gives birth, allow the well-honed atmospheric skills of Alun Bollinger to unfold in all their gloomy cinematographic glory. Written and directed by Mexican born Dana Rotberg, “White Lies” significantly reworks Ihimaera’s novella, “Medicine Woman.” Maori carvers return to their work, reasoned Ihimaera, so why not writers? Despite the re-carving of words, the early scenes of the movie lack pace, failing to provide momentum the emotional centre deserves. What unfolds in “White Lies” are three contrasting approaches to dominant Pakeha culture, each embodied in the three women: marginality in Paraiti, accommodation in Maraea, ultimate assimilation in Rebecca. What is thought provoking is to then lay “White Lies” alongside the First Testament. Israel’s experience of exile offers another perspective on how minority communities activate resistance. We see marginality in the return of Nehemiah to a Jerusalem destroyed. We see accommodation in the book of Esther, her willingness to parlay her sexuality in exchange for influence. We see assimilation in Jeremiah’s injunction to build houses, plant gardens and take wives. “White Lies” a century on offers little hope. Rebecca’s final decisions are chillingly bleak, while the forest gathering ways of Pariati are, in twentyfirst century New Zealand, long gone. All that remains, as the movie tagline declares, is the reality that redemption comes at a price. Christians will ponder the crucial birthing scene, in which Rebecca hangs in a crucifix position, arms spread wide, supported by a watching woman, in the painful journey through which new life will eventually be won. Ascension day in worship http://t.co/r4hzmm8I And theology http://t.co/XVHSIcVj. Anyhow, none of these posts rank anywhere on google, presumably not because they are bad, but simply because my blog is so small/does not know how to manipulate google rankings. We are told that google is great for democratisation of information, but it also feeds a very fastmoving, temporary society, in which if you’re not on page one, you’re off the digital radar. Which means that for little blogs like mine, what you post as a resource has a very short shelf life. Which, if you post things hoping they might resource others, becomes self-defeating. Until twitter. One short tweet this week led to a “brillant” comment by one person and a request by another to use the resources in worship. It put the resource back in circulation, by-passing the google gatekeeping and achieving the purpose of the blog – to share creativity, to pass on resources. Which makes platforms like twitter more important for little blogs like mine, more important if the web really is meant to enhance connection and resourcing, a subversion of the hierarchies that have developed so quickly in this so-called “flat” networked digital world. One, the Mission in digital frontiers learning day that we’re hosting at Uniting College on Thursday with Andrew Jones got picked up by the local media (here). Worth reading for the comments alone, and the realisation of the hostility which is the growing lot of Western Christianity. Two, Welcome to Australia is a new justice initiative. It’s simple – thus simply great. Between June 19 and 26, 2011, we’d like to say a big “Welcome to Australia” to asylum seekers, refugees, new arrivals and other migrants. We’d like you to throw a party in your home, street, office, sporting club or other community group to very publicly celebrate the beauty and depth that diversity adds to our nation. I was chatting with the organisers and pointed out the irony of me participating given that technically, I’m actually a new arrival aka a migrant. So they asked for my story, which is here. Sydney is already one of the 10 most ethnically and linguistically diverse cities in the world, along with Toronto, New York, London and Los Angeles. The internet has some downsides. But it also has some amazing upsides. I am currently working on some distance material, around the theme of Jesus Christ today. The aim is a course to help lay folk as they prepare to exercise their gifts, including in leading worship and preaching. Being a course by distance, the challenge is not to prepare pages and pages of words, but to encourage a range of ways to engage. On Tuesday night I was working on the section on Jesus Christ in history. I came across the Theologians Trading Cards, on the disseminary website. 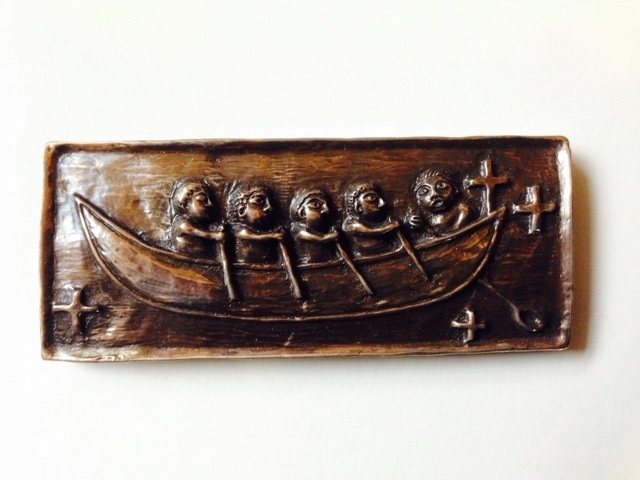 Could people arrange the theologians in various categories – geography, time, Christology from above/below? Could people play variants of snap or top trumps with their friends? A way to engage Jesus Christ in history in which the cards create interaction and question. A query email to the site owner and overnight there was email reply in regards to the Creative commons license. On Wednesday I was working on another section. I love the story in pages 3-4 of Scot McKnight’s A Community Called Atonement about the impact of Christ on a person’s actions/witness. (The whole book is an excellent resource, which I found helpful a few Easter’s ago in framing my preaching input over a Thursday, Friday, Sunday). A story opens up different ways of engaging. What is more, the story could then be used as an exercise, inviting folk to work out how the sources of theology – Scripture, tradition, experience, reason – are all there and are all at play. 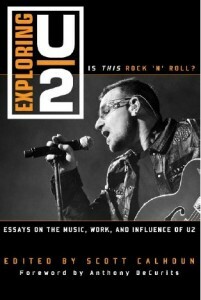 The story in McKnight’s book mentioned the title of a song. I googled the title, but could find no song with exactly that title. So I decided to email the author with my query. He replied with the contact details of the actual person who tells the story. Another email to her. And a reply, including some more detail, which will make the story even more helpful. In less than 48 hours, three conversations with three people on the other side of the world. Our shrinking world can certainly be full of richness.